(Newser) – Paul Manafort faces serious felony charges on alleged tax fraud, though the indictment unsealed against him and an associate on Monday does not appear at first glance to implicate the 2016 campaign of President Trump. The charges brought by special investigator Robert Mueller accuse Manafort of laundering about $18 million, reports the New York Times, which has a link to the actual indictment here. "Manafort used his hidden overseas wealth to enjoy a lavish lifestyle in the United States without paying taxes on that income," the indictment reads. Business associate Rick Gates also is implicated. "As part of the scheme, Manafort and Gates repeatedly provided false information to financial bookkeepers, tax accountants and legal counsel, among others," per the indictment. 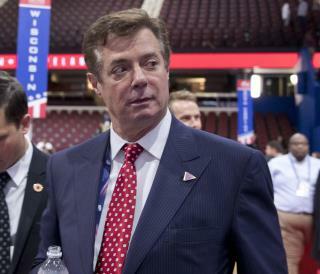 Manafort has long worked as a foreign lobbyist. Like it or not, there is still no evidence that Trump did anything wrong with the Russians. In fact, there is evidence that the Russians paid to discredit Trump's election. All you non- thinkers fell for that. You are so gullible. Either trump is the best psychic around or is really good at being a blame shifting projectionist. “As you’ve heard, earlier today the FBI after discovering new emails is reopening their investigation into Hillary Clinton… The investigation is the biggest political scandal since Watergate and it’s everybody’s hope that justice at last can be delivered.” - Trump Oct 28, 2016 “If Hillary Clinton were to be elected, it would create an unprecedented and protracted constitutional crisis . Haven’t we just been through a lot with the Clintons, right?” - Trump Nov 2, 2016 “Hillary is likely to be under investigation for many years, probably concluding in a criminal trial.” - Trump Nov 2, 2016 “She'll be under investigation for years. She'll be with trials. Our country, we have to get back to work.” - Trump Nov, 4, 2016 “Hillary has engaged in a criminal massive enterprise and cover-ups like probably nobody ever before.” - Trump Nov, 4, 2016 “There's virtually no doubt that FBI Director Comey and the great, great special agents of the FBI will be able to collect more than enough evidence to garner indictments against Hillary Clinton and her inner circle, despite her efforts to disparage them and to discredit them. If she were to win this election, it would create an unprecedented constitutional crisis. In that situation, we could very well have a sitting president under felony indictment and ultimately a criminal trial.” - Trump Nov 5, 2016 “Her current scandals and controversies will continue throughout her presidency and we will make it honestly, look, it's gonna be virtually impossible for her to govern. Now, the Republicans have talked very tough and the Democrats. It's gonna be just another mess for another four years, folks. A mess. We've got to get back to work, right? I mean, we have to get back to work.” - Trump Nov 5, 2016 “First thing you should do is get rid of Clinton. Hillary Clinton will be under investigation for a long, long time for her many crimes against our nation, our people, our democracy, likely concluding in a criminal trial.” - Trump Nov 6, 2016 “The investigations into her crimes will go on for a long, long time. The rank and file special agents at the FBI won't let her get away with these terrible crimes, including the deletion of 33,000 emails after receiving a congressional subpoena. Right now, she's being protected by a rigged system.” - Trump Nov 6, 2016 Who knew his crystal ball worked this well, except it was him he was talking about.